If you’re after a café with a lively atmosphere, amazing food, plenty of seating choices as well as ideas and food to prepare for other meals, this is the place to go. Unfortunately during our visit, chef David Bitton seemed too engrossed manning the extremely busy counter for us to interrupt for questions and a chat but we may say now that the man is a genius! Seating wise, there are tables out front, a kids corner, a private dining room and general seating area inside. Fresh produce, bread and gourmet food lines the walls and is available to purchase. The Bitton Gourmet range includes tapenades, sauces, jams, oils, dressings & more and can also be ordered through their website or via a number of distributors. At 10am on this particular Sunday, all of the tables outside were taken and the interior was filling up quickly. We were seated brisklyand tended to by a second waitress within seconds. Not sure what drinks we wanted, we asked her to return in a few minutes. After finally deciding, our food and drinks literally arrived within about five minutes of ordering! 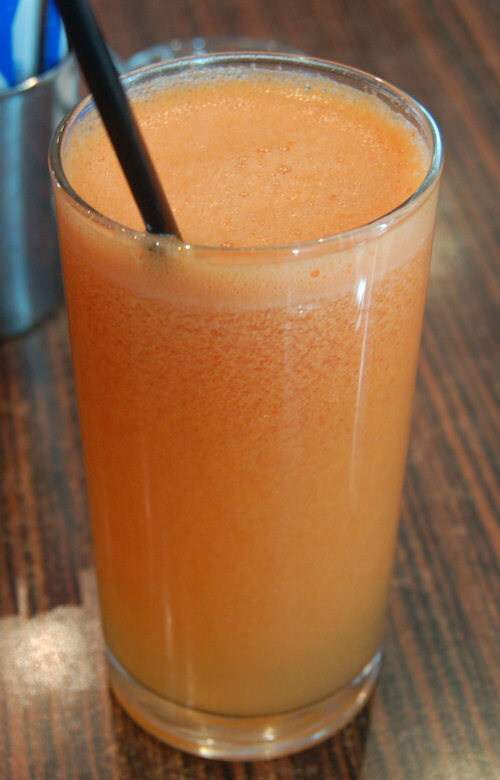 Fruit juice – so simple yet often destroyed by not having it freshly squeezed. 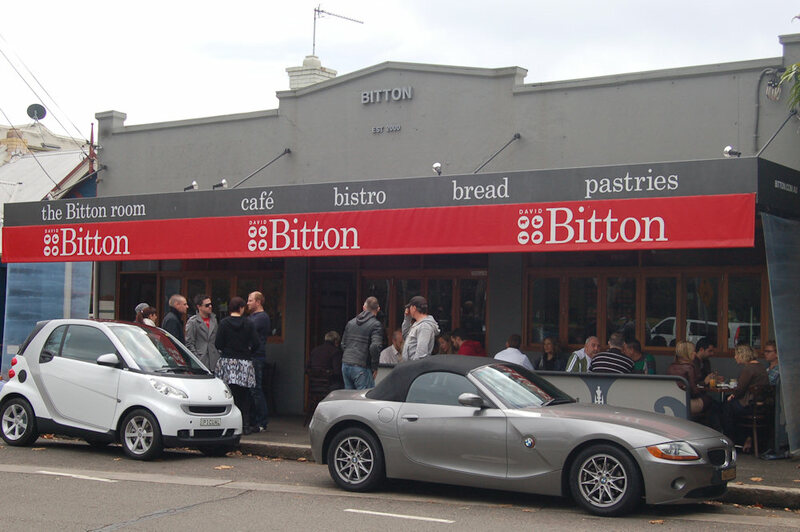 Bitton squeezes their fruit juice on premises with a choice of apple, pineapple, orange, watermelon, pink grapefruit and carrot. We enjoyed a pineapple and carrot juice ($5.50 or $5 for a single type of fruit) which was smaller than we would have hoped but mixed well and fresh. Bitton has a massive selection of teas. We sampled the Vanilla lemon heaven tea ($4.50), while others include Rise and Shine (lemon, licorice and ginger), minty, peppermint and Peace (chamomile and lavender). 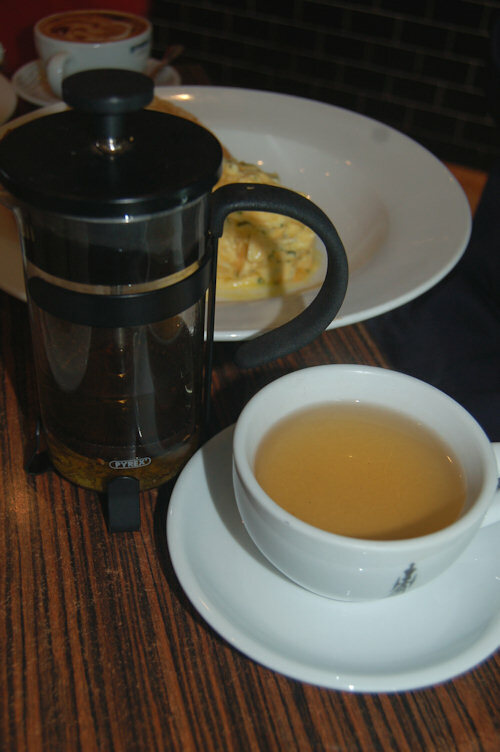 It was nice to try something new and the aroma of lemon was enjoyed by everyone sitting at our table. However, we don’t like the tea infusers that keep the tea trapped at the bottom of the container. If you like to sip your tea at a slow pace like we do, the leaves continue to infuse and the tea becomes bitter and undrinkable. This is what happened to our second cup of tea. 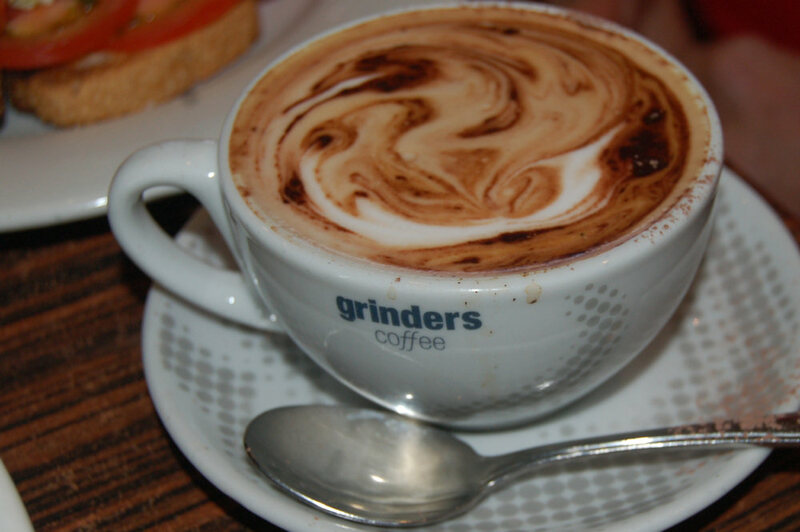 The Grinders coffee looked rushed (the result of a fairly large and popular establishment and takeaway orders arriving constantly) but had a smooth taste. Sizes are regular ($3.40), mug ($3.90) and bowl ($5). 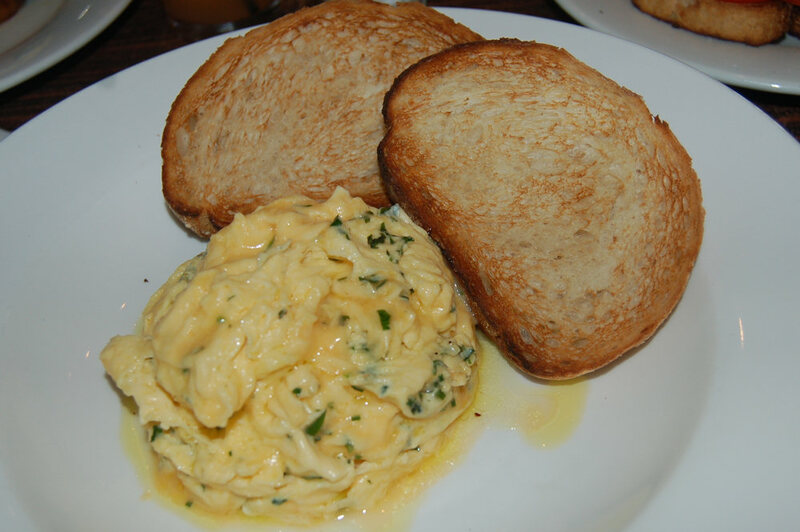 The Creamy scrambled eggs with fresh herbs and wood fired bread ($14.90) was soft and true to its name. The serving size was generous however we would’ve liked some roasted tomatoes or avocado on the side to vary the taste and texture. The toast was delicious and so thick we needed a steak knife to cut through it! 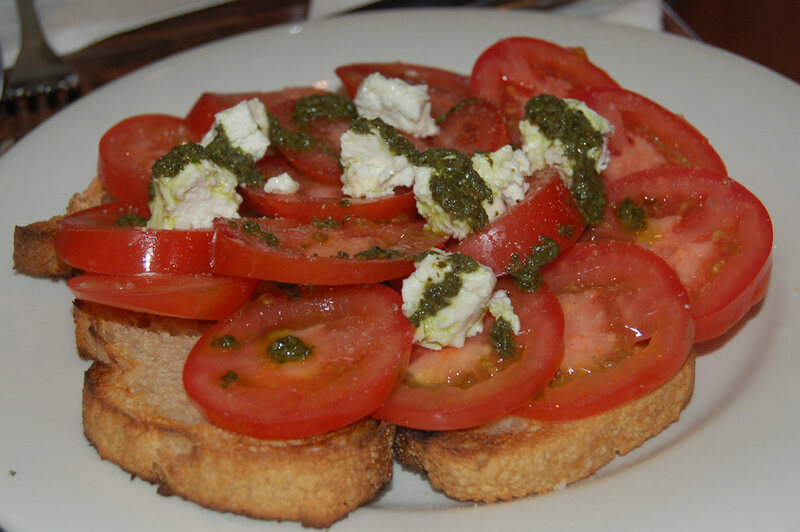 The wood fired sourdough bread with Roma tomato, goat’s cheese and basil oil ($13.90) is a simple-sounding dish but it provided some of the finest flavours at our table. The tomatoes tasted incredibly fresh and had a firm, succulent consistency. The goat’s cheese was smooth and of high quality. Luckily we were provided with a serrated knife as the bread crust can be hard to get through. 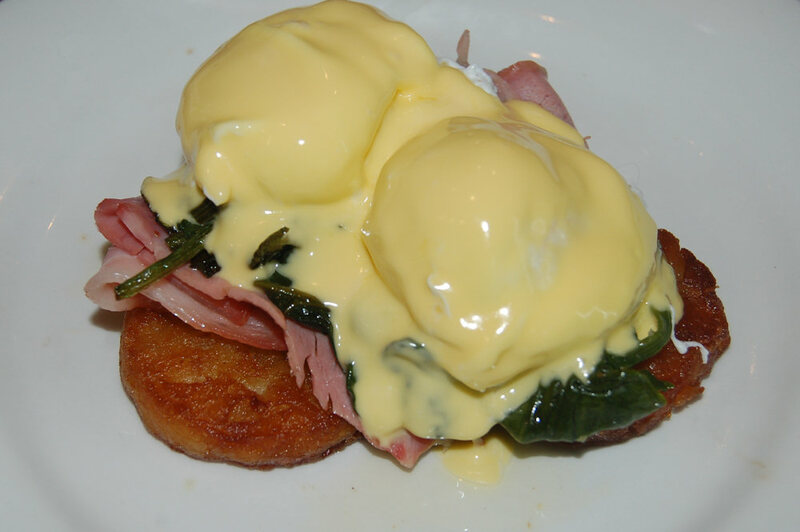 Considering himself the Benedict expert at this stage, Dane couldn’t resist ordering the Bitton version of this dish: poached eggs with Black Forest ham, spinach, potato roesti and hollandaise sauce ($18.50). The roestis were crispy on the outside yet fluffy within and provided a great base for the rest of the meal. The spinash was nice and buttery while the hollandaise smothering everything was made perfectly (one of the best we’ve tasted). The eggs were slightly disappointing compared to those of the dish below but overall everything was excellent (and surprisingly filling). Some slightly thicker slices of ham would have worked well though. One of the guests at our table ordered this dish in haste but was extremely pleased with her choice. 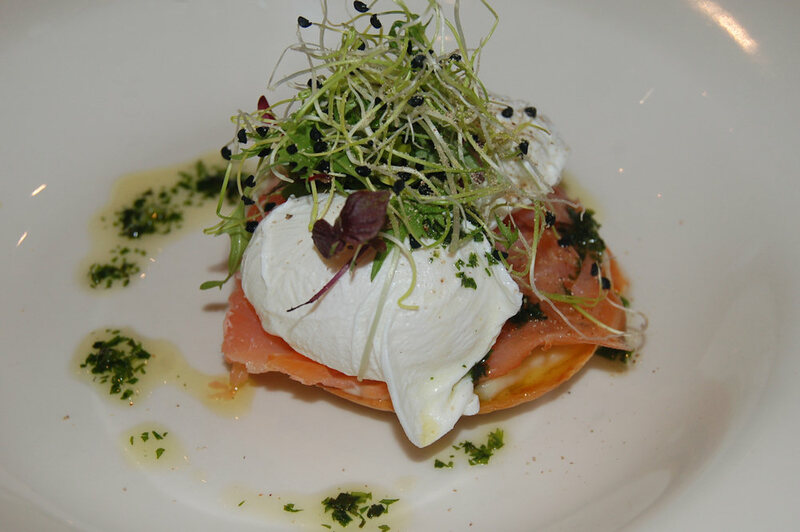 Order the smoked salmon and leek fondue tartlet with poached eggs ($17.90) next time you’re at Bitton and we’re sure you’ll agree. The tartlet beneath was the highlight – creamy and loaded with cheese, it wasn’t as rich as we anticipated. The eggs were poached as well as anyone could wish for and somehow they managed to squeeze two of them onto the very small space provided! All we can say is that it is dishes like this that show how expertly well crafted the menu is. Everything compliments each other perfectly and we tip our hats to Chef Bitton. There are a variety of breakfast and lunch side orders available including spicy lamb sausage, steamed green vegetables, bacon, green salad, spicy baked beans, chorizo and more ($5.50 each). The lunch menu becons our return with offersing such as: grass-fed beef minute steak with spicy onion jam and aiolo ($17.90), warm salad of chargrilled pumpkin, chickpea marsala, persian feta, almond and bitton dressing ($17.50) and tartlet of rosemary, thyme & vanialla oil infused lamb fillet with confit eschallot and tomato ($19.90). The low value score this week is actually not a criticism of Bitton. The prices are slightly higher when compared to other cafés but we can vouch for the fact that you’re not paying for the priveledge of eating at an establishment that the chef has simply deemed to be a cut above the rest. The food is the hero here as it is made with the highest quality ingredients and if you’re willing to treat yourself you will not be disappointed. The range of fresh and packaged goods available at Bitton inspired us to go home and cook a delicious meal. May we suggest you take a reusable bag with you to indulge in some ingredient shopping after your breakfast. A word of warning: there is a gourmet price tag attached so pick your ingredients well and supplement the rest with produce from local markets or grocers. By the time you’ve shopped and digested, it will be time for another meal! Payment Options: Credit cards, EFTPOS, cash. $20 minimum for any cards, 10% surcharge on public holidays, BYO – corkage $2 per person. This entry was posted in Sydney - South and tagged Dog friendly, Outdoor seating. Bookmark the permalink.